And so begins the story of 15-year-old Mari Pujols. She believes the baby she is carrying will love her unconditionally and never leave. Not like her mother who took off when she was only eight years old and not like her father who is in prison. It is Mari's hope that this baby will care for her, unlike her abuela. That the baby will stick around more than her on-again-off-again boyfriend. The baby will grow into a little human loyal to her as her two best friends. But doctors discover that the fetus has a birth defect called hypoplastic left heart syndrome: half of the baby's heart is missing. Now Mari is forced to make a life-altering decision. All while reading I kept thinking this story is so realistic. Somewhere, sometime there is a young teenage girl going through this heartbreaking struggle with little to no support. 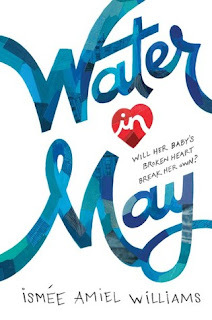 It wasn't until toward the end of the book that I learned Water in May is based on true events. Oh, this makes it an even more special debut. I haven't felt this much sympathy for a fictional character in a long time. Be warned that Water in May will cause waterworks in your eyes. Also, there is a lot of Spanish language and Dominican slang that may stunt reading; use the glossary at end of the book. I recommend it to teenage moms, younger-than-usual abuelas and young adults. Hopefully it will help families understand small blessings. Happy Early Pub Day, Ismée Amiel Williams! Water in May will be available Tuesday, September 12.